We consider the best credit cards for students ones that offer tools or features to help you build your credit and build good financial habits. Some may even offer rewards, perks or other incentives. Read on to see which credit cards for college students we think are at the top of the class. Rewards for good grades? Yes, and not just from your parents. Good Grades Rewards offers a $20 statement credit each school year that you maintain a Grade Point Average (GPA) of 3.0 or higher, for up to the next 5 years. Good Grades Rewards is only available to new cardmembers who indicate they are currently enrolled in college on their application and whose account is current and remains open when the Good Grades Rewards is requested. Please note the terms of Good Grades Rewards offer is subject to change. One of our favorite features from the Discover it® portfolio of cards is also available to cardmembers of this student card. 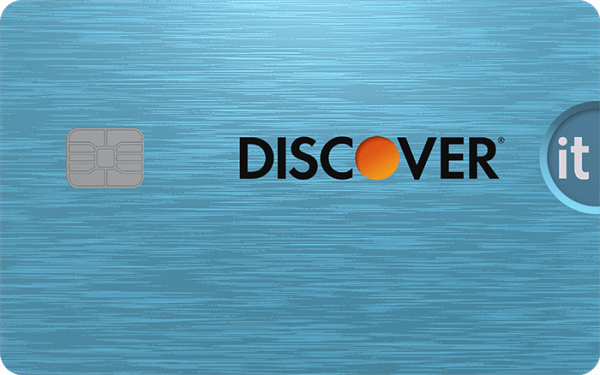 There is an introductory offer – for new cardmembers only, Discover will match all the cash back you’ve earned at the end of your first year, automatically. There’s no signing up and no limit to how much is matched. This card has no annual fee, no foreign transaction fees, and Discover won’t charge a late fee for your first late payment. Another plus, paying late won’t change your Annual Percentage Rate (APR). Discover it® Student Cash Back offers an introductory 0% APR on purchases for 6 months and a 10.99% introductory APR on balance transfers for 6 months. After the introductory APR period ends, the Standard Variable Purchase APR of 15.24% – 24.24% applies to both your purchases and balance transfers. If you are considering transferring a balance from a higher rate credit card keep in mind there is a balance transfer fee of 3% of the amount of each transfer. If you lose your card, use the Freeze It® app or access Freeze It® through Discover’s website. This feature essentially turns off your card, until you find it again, so that no new purchases, cash advances and balance transfer transactions will be approved while the card is frozen. Check with Discover’s customer service, which is 100% U.S. based, and ask if you can set up payment alerts and reminders, which if utilized properly by you, can help you so you don’t miss a payment. Additionally, get your free Credit Scorecard with your FICO® Credit Score, number of recent inquiries and more; receive free Social Security number alerts—Discover will monitor thousands of risky websites when you sign up. 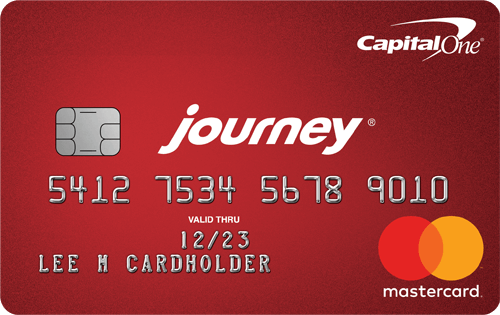 Students looking for a no-fuss option may want to check out the Journey® Student Rewards from Capital One®. The rewards program is as straightforward as it gets: earn 1% cash back on all your purchases. Pay on time to boost your cash back to a total of 1.25% for that month. This card has no annual fee and no foreign transaction fees, so you can take it with you when you travel or study abroad. After making your first 5 monthly payments on time, you get access to a higher credit line. While the rewards program isn’t as flashy as some others, the Journey® Student Rewards from Capital One® doesn’t require you to jump through hoops (like signing up for each quarter’s featured bonus category) to access rewards. Casual, occasional card users may appreciate the convenience. Other features we want to mention, monitor your credit profile with the CreditWise® app, it’s free for everyone, get customized alerts and manage your account with the Capital One mobile app. If your credit isn’t strong enough to qualify for a credit card, a secured card is an alternative. You’ll be required to deposit a certain amount of money as collateral to the issuing bank of the credit card, and this deposit typically will be your limit on the card. With consistent responsible use by you, the U.S. Bank Secured Visa® Card, can be used as a tool to help you establish a credit history to help you qualify for traditional credit cards up the road. The annual fee is $29 and the variable Annual Percentage Rate (APR) for purchases and balance transfers is 21.24% and will vary with the market based on the Prime Rate. What we like is U.S. Bank Secured Visa® Card also offers auto pay, that can help you avoid interest and late fees with automatic payments. Online banking and automatic bill pay options may make it easier to stay on track of your finances. Over time, by managing all of your credit obligations responsibly and consistently U.S. Bank may consider moving you to an unsecured credit card product. You’re planning to apply for a credit card, but do you really know how to use one wisely? Here are the basics which may help you to set yourself up to be a responsible cardholder. Credit cards are a loan, in a manner of speaking, not a source of income. If you don’t have cash on hand at the moment, swiping your card for your purchases is a way of borrowing money from the issuer until the time comes to pay the bill. As long as you pay the balance for your purchases in full and on time every month, for most credit cards you’re effectively getting an interest-free loan. Be careful and read the fine print there are some credit card issuers who may charge you interest on new purchases commencing from the transaction date. Important to note is that balance transfers that are not a part of a promotional offer, as well as cash advances, are generally charged interest from the transaction date. You also have the option to pay a smaller amount (minimum due) if you can’t afford to pay back what you spent during the month. If this happens, the credit card company will charge interest on the remaining balance, meaning you could end up paying a lot more over time if you continue to carry a balance. This is one way that people find themselves accruing credit card debt. Besides helping you stay out of debt, paying your balance promptly is a way to build credit. Credit card issuer’s use your credit score as one way to assess how responsible you are with credit. Paying on time and spending within your means helps show you’re trustworthy with other peoples’ money. Reckless behavior with a credit card can lead to less favorable rates (or application denial) on other credit card or loans in the future. Also, new rules in the mortgage industry require lenders to look at whether you pay down your debt or just make minimum payments, carrying old debt with you from month to month. You could risk your chance of getting approved for a mortgage if you don’t make headway on your balances. Rewards programs incentivize people to choose one card over another. If you don’t incur interest or fees on your transactions or have an annual fee to pay, a cash back program can actually “pay” you back a small amount for purchases made with your credit card. Keep in mind secured credit cards are a bit different in that you are required to put down a deposit which is used for collateral in the event you’re unable to pay your credit card balance. The card issuer will determine your credit limit, usually equal to the amount of your deposit. If you demonstrate responsible credit management you may qualify for an unsecured credit card (a credit card that does not require a deposit). The CARD Act of 2009 requires students under 21 years old to provide proof of income or have a parent or guardian co-sign in order to acquire a credit card. If you’re taking the second option, you’ve got a couple of potential advantages. However be sure to check with the credit card issuer as to their policy around co-applicants and co-signing as not all credit card issuers allow or accept co-applicants and co-signing. A responsible parent can help teach you smart credit habits. A co-signer with good credit can help you qualify for a card with a stronger rewards program than you could get on your own. If the student is late on payments, the co-signer’s credit will be negatively impacted. If the student defaults, the co-signer is legally responsible for the entire debt. The co-signed account will show up on the co-signer’s credit report and affect that person’s utilization ratio. Lenders will take debt on the co-signed card into account when considering either of you for a loan. If the student defaults on the payment, the co-signing parent is legally on the hook for the balance. Co-signing is not an easily reversible decision. Irresponsible card use can be a point of stress in the relationship between students and parents. If you go this route, make your expectations for the account use clear. Keep communication lines open to head off mistakes before they become a major problem for both of you. And as we mentioned before be sure to check with the credit card issuer as to their policy around co-applicants and co-signing, as not all card issuers accept co-applicants or co-signing. How can students use a credit card the right way? Establishing good credit habits as early as possible can benefit you for years to come. Financial institutions review your credit to decide whether to offer you a loan, and on what terms. Over time, responsible behavior shows banks and other lenders that you can be trusted. Spend based on your income, not your credit limit. Treating your credit limit like a second bank account is an easy way to get into financial trouble. Make your purchase decisions based on your paycheck – your available income, your budget. Keep utilization low. The rule of thumb is 30%, but that’s not to say that 29% guarantees you a good credit score or that 33% spells doom. It just tends to make you look more financially stable if you use less loaned money on a regular basis than if you’re constantly close to maxing out your account. The lower your balance, the better. Use your card regularly. You need to demonstrate the ability to use credit responsibly, and you can only do that by making purchases and paying them off. Charge a small amount each month and pay the bill in full and on time. Pay on time every month. Almost a third of your credit score is based on payment history. Meeting deadlines is crucial. Pay the full amount due. When you pay interest, you increase the cost of everything you buy on the card. At least pay more than the minimum. Sometimes, it’s not possible to pay the whole balance at once. Making just the minimum payment means you’ll pay maximum interest over time, so send in as much as you can. Tweak your budget so you don’t have to make the same mistake again. Use rewards, but don’t let them lead you astray. You wouldn’t be tempted to buy something you didn’t need in a store just because you saw it was marked down by 1%. Treat cash back rewards the same way. It’s a nice perk that can add up over time, but it’s not worth spending more than you otherwise would. Once cash back rewards start growing, you might decide to apply them toward college. Why not? College is expensive, and every bit helps. There are a few cards out there that will automatically funnel cash back rewards into a 529 plan. Of course, you can also redeem cash back from any credit card account that offers it and deposit the funds in a college savings plan. The big trap to watch out for is overspending to try to earn rewards for a college fund or to earn rewards in general. A great option is to earmark cash back rewards for a college expense, like textbooks. Depending on the rewards program and your spending habits, annual rewards could cover a decent chunk of your class materials. As always, pay on time and avoid carrying a balance. That’s the best way to keep interest and other fees from wiping out any gain you’ve accrued from a rewards program. Getting a credit card can be very exciting, especially if it’s your first, so take your time and find out as much as possible about the card or cards you’re interested in before you apply, make sure it’s a fit for you, and that you know what you’re getting into (as far as interest rate, fees, rewards, etc.) as opening a credit card is an important financial decision. Keep in mind a credit card can offer you tools to assist you in maintaining your account but ultimately it’s up to you practice responsible credit card management. And as we mentioned before, pay on time and avoid carrying a balance, that’s the best way to keep interest and other fees from wiping out any gain you’ve accrued from a rewards program. Independent Review Disclosure: All the information about the U.S. Bank Secured Visa® Card has been collected independently by CreditSesame.com and has not been reviewed or provided by the issuer of this card. The U.S. Bank Secured Visa® Card is not available through CreditSesame.com.